In a previous article I mentioned how the Spanish had underestimated the breadth of the Pacific Ocean in the 16th century. A narrower Pacific, of course, would also mean a smaller globe - i.e. the distance around the circumference of the Earth would be shorter. Interestingly, Columbus originally underestimated the circumference of the Earth as well. He believed the distance was significantly shorter, so much so that he was confident that on sailing west he would, in reasonable time, reach the east coast of Asia. Had the Americas not been in his way his journey would have been almost impossibly long due to this drastic miscalculation. He underestimated the size of the Earth and indicated that Europe and Asia combined to cover half of the planet's circumference, whereas in actuality these two continents extend to only 130° (rather than 180°). So we have a situation where Eratosthenes measured the circumference of the Earth to a reasonable degree of accuracy two hundred years before Christ. Then four hundred years later Ptolemy is less accurate. Then the Persians re-calculate it accurately once again in the 9th century. Only for Columbus six hundred years later to regress back. Then on top of this, in the following century, the Spanish (who actually sailed both oceans) still remained in error about the circumference. Now on this blog I've speculated that the current measurement of the Pacific Ocean could be wrong. Obviously this is quite a bold, and possibly very foolish thing to think, but if the world map is wrong in any way - and questioning the validity of the map is the very purpose of this blog series - then it would be much easier to misrepresent the oceans than it would to misrepresent the landmasses. The land gets lots of people traffic - billions of humans are milling about on foot and in cars every day, but the oceans much less so - and then it's mainly the traffic of people being ferried by boat or plane, who have only a vague idea of the vast journeys they're making. So if this was the case what would be the consequences for the rest of the globe? For a start if the Pacific was slightly narrower the circumference of the Earth would be smaller. Also there would not only be less ocean, but also a little less space at either pole. I've already looked at the North Pacific and the Arctic in previous articles on this blog, however I've yet to look at the Antarctic. So if we follow a straight line south through the middle of the Pacific Ocean where do we reach? A place called Marie Byrd Land, named after the wife of the famous polar explorer Admiral Byrd. Oddly it's the only part of Antarctica not subject to a territorial claim by any individual sovereign country. 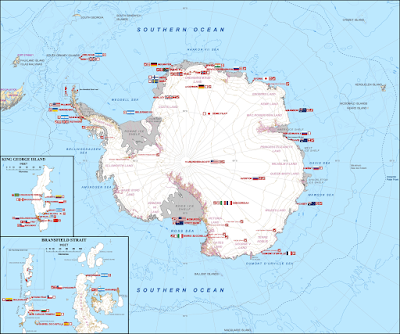 If we look at the following map from Wikipedia of research stations in Antarctica we can also see that Marie Byrd Land seems strangely devoid of activity. Interesting. 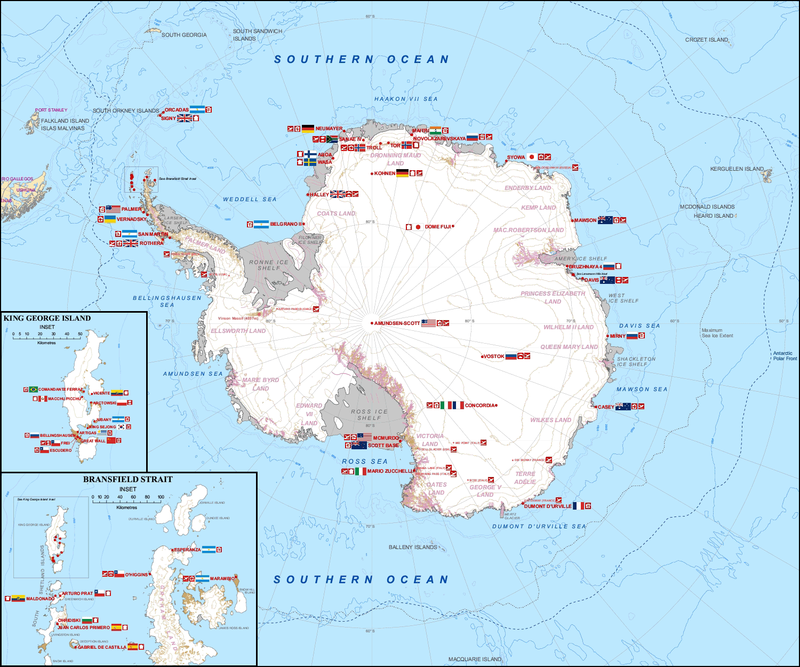 Although, it should also be noted that there have been Antarctic research stations in this part of Antarctica in the past - such as Byrd Station, established during Operation Deep Freeze II, and a Russian station called Russkaya. Where is the Curvature? Where? On a final note it's worth mentioning, especially as we're talking about Antarctica here, that a smaller circumference of the Earth would also mean more observable curve - i.e. it would be easier to see the curvature of the Earth's surface, as the globe itself would be slightly smaller in relation to any observer. This is a familiar topic for anyone interested it the current Flat Earth revival online. Interestingly, if we look at the UN logo - one of the favoured, in-your-face, flat earth depictions - you can see that the more recent version (first introduced in 1946) shows a Pacific Ocean somewhat broader than what's shown in the original logo (which was produced in 1945). 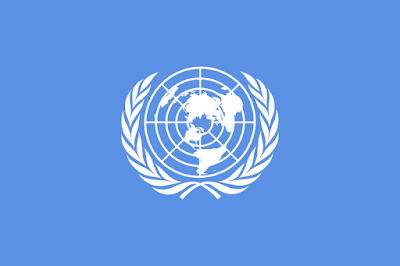 Now I'm sure this was purely a question of aesthetic taste on the part of the UN. After all, it's meant to be a symbol of the world and not necessarily an accurate usable map. Still, though, it's quite interesting. However, on the original 1945 version below the distance is more like 2 and half slices. Again, I'd say the more recent version probably looks more pleasing to the eye, plus the continents seem less chunky and distorted. So I'm guessing the change in ocean distance is more a consequence of design than actual measurement. 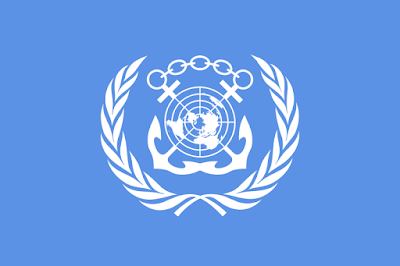 Oddly though the International Maritime Organization still use a logo that's similar to the original. The globe used in the original design was an azimuthal projection focused on the North Pole with the United States, the host nation of the conference, at the centre. 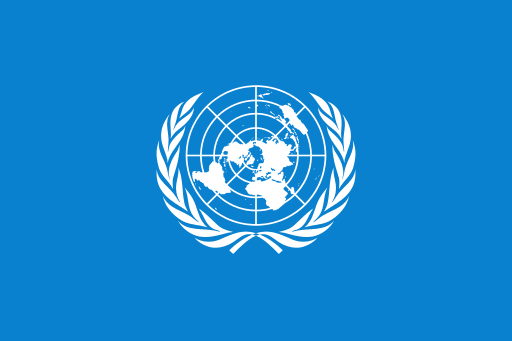 The projection that was used cut off portions of the Southern Hemisphere at the latitude of Argentina, which was acceptable at the time, as Argentina was not planned to be an original member of the United Nations. 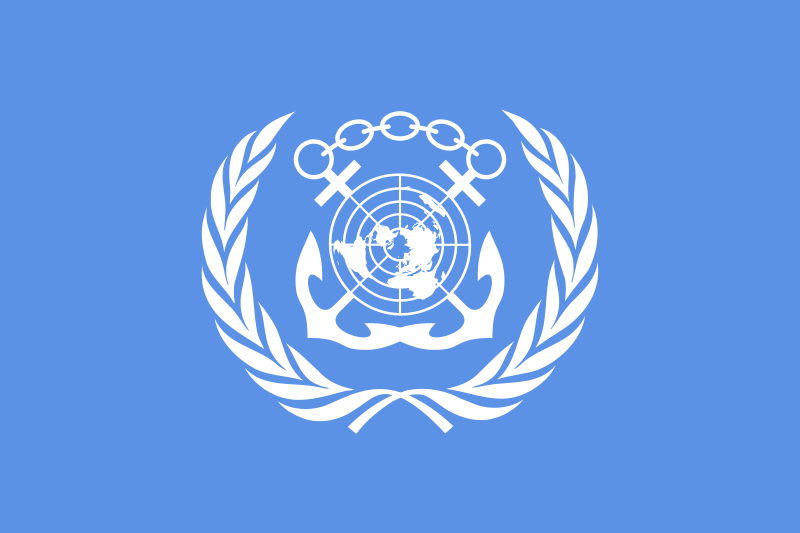 The projection was later altered so that no country will be at prominence within the flag. 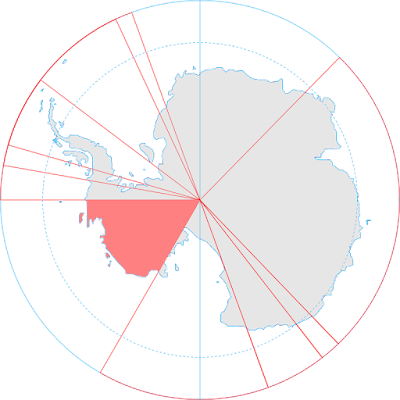 The new logo was now designed so that the globe is bisected in the centre by the Prime Meridian and the International Date Line.